Product categories of Juicer & Squeezer, we are specialized manufacturers from China, Hand Press Juicer, Automatic Juicer suppliers/factory, wholesale high-quality products of Silicone Manual Squeezer R & D and manufacturing, we have the perfect after-sales service and technical support. Look forward to your cooperation! A juicer (also known as juicing machine or juice extractor) is a tool used to extract juice from fruits, herbs, leafy greens and other types of vegetables in a process called juicing. It crushes, grinds, and/or squeezes the juice out of the pulp. 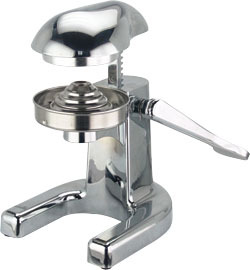 Some types of juicers can also function as a food processor. Most of the twin gear and horizontal masticating juicers have attachments for crushing herbs and spices, extruding pasta, noodles or bread sticks, making baby food and nut butter, grinding coffee, making nut milk, etc.